As the Nation prepares to observe the 150th anniversary of the Civil War, the New York State Military History Museum and Veterans Research Center is making capsule histories of 360,000 New York Civil War Soldiers available online. The Civil War began on April 12 1861 when Confederate cannons fired on Union-occupied Fort Sumter in the harbor of Charleston, South Caroline. On April 19 1861 the New York National Guard’s 7th Regiment was mustered into service and departed for Washington to defend the Capitol. More than 360,000 Soldiers enlisted in New York regiments to fight for the Union during the Civil War. Capsule histories of those Soldiers military records were recorded from 1893 to 1906 in 17 volumes based on data from the New York Adjutant General’s Office and the War Department, the predecessor to today’s Department of the Army. These records have been posted in PDFformat and are searchable. The Bureau of Military Statistics was established by the Legislature in 1863 to record the history of New York’s volunteer Soldiers by collecting newspaper clippings, artifacts, and securing the battle flags of returning units. The Bureau published five reports summarizing the information collected and detailing the contributions made by New Yorkers during the Civil War. These records are also in searchable PDF format. That collection of printed materials, weapons, artifacts and battle flags is maintained by the Military Museum today under the control of the New York State Division of Military and Naval Affairs. Visitors to the museum’s website can find out that John Hurley, the assistant surgeon of New York City’s 69th Infantry Regiment, who enlisted on Nov. 1 1862, was killed accidently in camp on April 15, 1863 near Falmouth, Virginia. Or they can learn that the towns of Onondaga County collected $8.2 million in taxes to pay bonuses to Soldiers enrolling in volunteer regiments in 1862. The museum staff has also begun scanning in, and making available online most of the thousands of Civil War newspaper clippings that the museum has preserved since the 1860s. The process of digitizing these historic documents began almost eight years ago and has relied heavily on volunteers willing to spend time scanning in documents, Gandy said. The museum’s catalog of its collection of photographs, books, articles, and paintings is also being turned into digital information and is now searchable online, Gandy said. While the museum holds vast amounts of information about the Civil War and is making that available online, other military data of interest to history and genealogy buffs is also now available online. Thanks to the efforts of volunteers the names of all 13,025 who served as officers in the New York State Militia, the precursor to the New York National Guard, prior to 1858, have been indexed. Local high school students fulfilling the obligation to spend 20 hours volunteering did much of this work over the last year, Gandy said. Another volunteer project involved establishing a searchable database of the 23,315 members of the New York National Guard who were awarded the New York State Long and Faithful Service Medal between its inception in 1894 and 1963. The Military History Museum is also the custodian of New York’s Civil War Battle Flags. More than 800 flags collected when regiments returned from the war are stored. Many of those have been conserved. Other items now available online at the New York State Military Museum website relate to the New York National Guard’s history in World War I and World War II. Copies of two publications issued just before and during World War I, the &#8220Rio Grande Rattler&#8221 from 1916 and the &#8220Wadsworth Gas Attack &#8220from 1917 are now available for download from the website. The Rio Grande Rattler was published when the New York National Guard was mobilized and sent to the Mexican Border in 1916 by President Woodrow Wilson following a raid on Columbus New Mexico by the troops of Mexican Revolutionary Poncho Villa. New York National Guardsmen guarded the border with Mexico in 1916 just as they would in 2006. In 1917, New York’s 27th Division was mobilized for service in World War II and trained at Camp Wadsworth South Carolina. Twenty-three years later the Guardsmen of the 27th Division were again on federal service, this time at Fort McClellan Maryland following President Franklin Roosevelt’s activation of the National Guard for one year of service following the successful German invasion of France. The yearbook published for the division’s Soldiers that year, which includes photographs of every unit and key officer, as well as pictures of the training, can be downloaded. 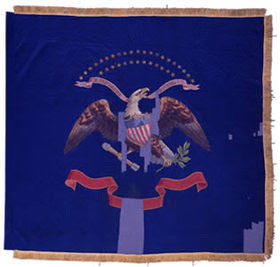 Photo: The painted silk regimental battle flag carried by the 125th New York Volunteer Infantry Regiment during the Civil War. Copies of two publications issued just before and during World War I, the “Rio Grande Rattler” from 1916 and the “Wadsworth Gas Attack “from 1917 are now available for download from the website. The New York State Board for Historic Preservation recommended that 24 properties be added to the State and National Registers of Historic Places, including the nationally significant Haviland Middle School in Hyde Park and the birthplace of an important American statesman, William H. Seward. Franklin Delano Roosevelt High School, Hyde Park. – today the Haviland Middle School, the architecturally and historically significant Colonial Revival-style school shares direct associations with President Franklin Delano Roosevelt, who, along with First Lady Eleanor Roosevelt, dedicated the building at a public ceremony in October 1940, and made several subsequent appearances there. The Calumet, Buffalo – the 1906 commercial building is unique example of the use of glazed architectural terra cotta, decorated with running reeds, their leaves and flowers. The Zink Block, Buffalo – the 1896 commercial building with Italian Renaissance styling is a particularly rare resource on the once thriving Connecticut Street commercial corridor, which before the mid-century stood as a thriving commercial anchor for the neighborhood. Kensington Gardens Apartment Complex, Buffalo – the apartment complex built for the influx of workers to the city’s World War II industries reflects designs of the Garden City movement and was one of the earliest projects supported by the Federal Housing Administration. Glen Cove Post Office, Glen Cove – the distinctive Craftsman/Tudor-style structure was built in 1905 to serve the community’s fast-growing population. Johns S. Phipps Estate, Old Westbury – the National Register of Historic Places listing from 1976 will be amended to include a large part of the property known as Orchard Hill, which was part of the original estate, and the more information on the significance of the estate’s landscaping and architecture. John G. Ayling House, Syracuse – the 1915 Tudor Revival home was designed by noted Syracuse architect Ward Wellington Ward. Indian Castle Village Site, Manlius and Carley Onondaga Village Site, Pompey – the two sites are significant in the history of the Onondaga Nation and the regional development of the Iroquois Confederation and have yielded significant archaeological insight into domestic life in the seventeenth century. John G. Beakes House, Middletown – built around 1884, the Queen Anne-style home is an architecturally significant example of fashionable middle class housing erected at a time when the city’s West Main Street was being developed as a desirable residential quarter. Grace Episcopal Church, Middletown – a prominent and recognizable landmark built in 1846 and substantially modified in the late 1860s, Grace Episcopal Church’s soaring spire and highly picturesque masonry work mark it as a significant example of 19th century Gothic Revival-style religious architecture. Mortimer Mapes House/William H. Seward Birthplace, Florida – the property includes an 1887 Queen Anne-style home built for a prominent local citizen as well as the 1797 home – later converted into a carriage house – where New York Governor, U.S. Senator and U.S. Secretary of State William H. Seward was born. Saint Luke’s Episcopal Church, Forest Hills – the church and parish hall complex built in stages between 1924 and 1950 is an outstanding example of early-20 century Collegiate Gothic architecture. Louis A. and Laura Stim House/Casa Belvedere, Staten Island – the 1908 Renaissance mansion, a prominent reminder of the 19th and early 20th-century development of Grymes Hill as a fashionable enclave of great estates and overlooking New York Harbor, is one of the few houses of its kind surviving on Staten Island. Jonesville Store, Jonesville – originally built about 1845 or 1850, and expanded in 1900, the Main Street building has been a community gathering spot since throughout its history. Mohawk Valley Grange Hall, Clifton Park – the 1896 single-story wood frame building used as a gathering place for the agricultural community retains its rural setting, despite the town’s increasing suburbanization. Abraham Best House, Vischer Ferry – built around 1815, the sophisticated brick federal farmhouse is a rare survivor from the agricultural era of Clifton Park. Cyrus Rexford House, Rexford – the Stick-style Victorian was built in 1883 by Cyrus Rexford, who owned a canal store in the hamlet named for his father, and served as Clifton Park town supervisor and justice of the peace. Winganhauppauge, Islip – the 1941 French Provincial style home was built for Dr. Richard Pasternack, a research scientist whose work allowed Pfizer, his employer, to become the largest producer and distributor of pharmaceuticals in the world in the twentieth century. The Edwards Homestead, Sayville – believed to be the oldest extant residence in Sayville with a portion dating to 1785, the home is an excellent surviving example of an early Long Island farmstead that began as a smaller New England Colonial but expanded over time by the family of early colonial settlers. Greenville Preparative Meeting House/Catskill Meeting House, Grahamsville – built in 1838-39 by Quakers from New England and the Hudson Valley, the simple and symmetrical building remains virtually unchanged since its original construction, lacking central heat, electricity, and indoor plumbing. tched spruce log walls, rustic rough hewn masonry chimney, wraparound porch, and interior rustic detailing. Hartsdale Railroad Station, Hartsdale – built in 1914 to replace and earlier, smaller wood frame structure, the Tudor Revival-style structure has a pivotal role in the connecting Hartsdale to New York City and attracting homeowners to the community. The Fort La Presentation Association’s annual Founder’s Day Weekend will host the 250th anniversary commemoration on Lighthouse Point, July 16-18, 2010. 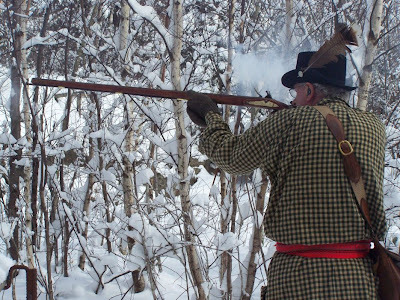 Dressed in 18th-century clothes, military re-enactors (army & navy) and heritage interpreters from Canada and the US will camp under canvas and cook over fires. Each afternoon, they will battle on land and water to bring the Battle of the Thousand Islands to life. 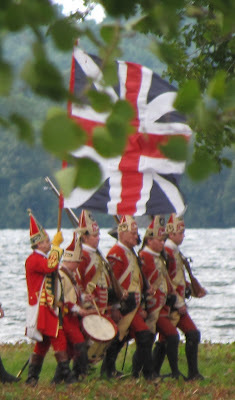 The Battle of the Thousand Islands, the last significant clash of French and British forces of that distant war, was fought in two parts in August 1760. The capture of the French corvette L’Outaouaise and the siege of Fort Levis opened the upper St. Lawrence River to Montreal. In September 1760, Montreal capitulated, and the hostilities ended. Founder’s Day Weekend is more than a military camp. Children’s games and military musters, more than 30 18th-century merchants and artisans, and period dancing are some of the activities that also include a deck tour of a schooner typical of the 1700s. There will be fur traders, a blacksmith, a tinsmith, and displays of other trades and early medical equipment. Ogdensburg native and Hollywood actor Mark Valley (Boston Legal and Human Target) plans to dress the part and join the re-enactors. A number of military attaches posted in Ottawa, along with other special guests, will review the troops. Special visitors are expected from France. Founder’s Day Weekend, on Lighthouse Point, is adjacent to the site of the original Fort de La Presentation (1749-1759). Admission of $8 per adult and $1 per child opens the door to a colorful colonial world. For information, visit www.fortlapresentation.net or call the St. Lawrence County Chamber of Commerce at 1 877-228-7810. The Fort La Presentation Association is facing a financial challenge by hosting this 250th anniversary commemoration. Ironically, the Fort Association was invited by New York State to host the final Signature Event for which it is unlikely to be reimbursed in the foreseeable future. Ottawa, along with other special guests, will review the troops. Special visitors are expected from France. For information, visit www.fortlapresentation.net[/CATS] or call the St. Lawrence County Chamber of Commerce at 1 877-228-7810. One of the blogs I’ve been following regularly (and you occasionally see posted in my New York History News Feature at right) is Jeff Siemers’ Algonkian Church History. Jeff is a Reference Librarian at Moraine Park Technical College (Fond du Lac Campus) and has recently written a series of outstanding posts on the New York Indian Removal that are highly recommended reading. If you include the Brothertowners, there are 12 American Indian communities in Wisconsin, but mostly they are relatively small and &#8211 except for the Oneidas &#8211 rural (or in forests). As a result, most white Wisconsinites don’t have a lot of awareness of Wisconsin Indians. I was not much more aware than most other whites, until I took up the sport of whitewater kayaking (in 1995). I was part of a club that got together on Tuesday evenings&#8230-we paddled the Red River which i realized was close to the Menominee reservation, but I didn’t know that we were closer to another reservation, legally known as the Stockbridge-Munsee Community. Anyway, the spring snowmelt (and/or rain) makes normally unrunnable stretches of water runnable, and in April, 2001 I was part of a group that paddled the seldom-run upper Red &#8211 we were stopped by an Stockbridge-Munsee tribal employee who explained we were trespassing on a federally recognized Indian Reservation. The employee told us something about the history of the Stockbridge Mohicans and let us complete our trip. Anyway, it was on that trip that another (white) paddler that lived in the area told me about an old and rare bible given to the Indians by the British. It aroused my curiousity &#8211 months later I visited the museum where the bible is held, then forgot all about it. Until I went back to school to become a librarian&#8230-.There I found myself in a class called the history of books and printing &#8211 and was racking my brain to think of a topic for my term paper &#8211 that’s when I remembered the Stockbridge Bible (it was fall, 2003 by then). After many re-writes, the project that began as a term paper was published by The Book Collector (Spring, 2007 issue) http://www.thebookcollector.co.uk/ (the world’s foremost authority on old and rare books). I’ve continued my research way beyond the Stockbridge Bible since then, of course&#8230- gone on a lot of tangents. my New York History News Feature at right) is Jeff Siemers’ Algonkian Church History[/CATS]. 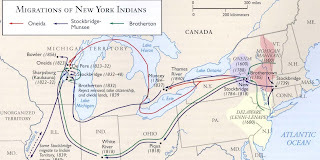 Jeff is a Reference Librarian at Moraine Park Technical College (Fond du Lac Campus) and has recently written a series of outstanding posts on the New York Indian Removal[/CATS] that are highly recommended reading. If you include the Brothertowners, there are 12 American Indian communities in Wisconsin, but mostly they are relatively small and – except for the Oneidas – rural (or in forests). As a result, most white Wisconsinites don’t have a lot of awareness of Wisconsin Indians. I was not much more aware than most other whites, until I took up the sport of whitewater kayaking (in 1995). I was part of a club that got together on Tuesday evenings…we paddled the Red River which i realized was close to the Menominee reservation, but I didn’t know that we were closer to another reservation, legally known as the Stockbridge-Munsee Community. Anyway, the spring snowmelt (and/or rain) makes normally unrunnable stretches of water runnable, and in April, 2001 I was part of a group that paddled the seldom-run upper Red – we were stopped by an Stockbridge-Munsee tribal employee who explained we were trespassing on a federally recognized Indian Reservation. The employee told us something about the history of the Stockbridge Mohicans and let us complete our trip. Anyway, it was on that trip that another (white) paddler that lived in the area told me about an old and rare bible given to the Indians by the British. It aroused my curiousity – months later I visited the museum where the bible is held, then forgot all about it. Until I went back to school to become a librarian….There I found myself in a class called the history of books and printing – and was racking my brain to think of a topic for my term paper – that’s when I remembered the Stockbridge Bible (it was fall, 2003 by then). After many re-writes, the project that began as a term paper was published by The Book Collector (Spring, 2007 issue) http://www.thebookcollector.co.uk/[/CATS] (the world’s foremost authority on old and rare books). I’ve continued my research way beyond the Stockbridge Bible since then, of course… gone on a lot of tangents. Theatre Askew’s production of William M. Hoffman (As Is- Ghosts of Versailles) and Anthony Holland’s Cornbury: The Queen’s Governor is more than an entertaining romp. In relating the story of Lord Cornbury, one of New York’s first governors and a rumored cross-dresser, Theatre Askew is leading an in-depth exploration of how the rise of a free press in colonial New York affected the cultural framework in the city and how the dynamic of that early press compares to the recent rise in new media. A panel entitled &#8220The Buzz in Olde New York&#8221 will be hosted in collaboration with The New York Historical Society and will feature public historian Kathleen Hulser, Nicholas F. Benton, publisher and editor of the alternative newspaper The Falls Church News-Press, and new media scholar Chris Anderson. The panel will discuss the role of a free press in establishing a cultural milieu of NY, while simultaneously perpetuating rumors and political viewpoints, particularly the myth of Edward Hyde, Lord Cornbury, the English governor of New York and New Jersey, from 1701-1708. A controversial figure, Cornbury was remembered for centuries for his rumored habit of dressing as his first cousin, Queen Anne. The rumor of Cornbury’s cross-dressing was perpetuated through the recently de-regulated press of the day and bears remarkable similarity to the way rumors are now spread about modern political candidates online. Mon., Wed – Sat. : 8:00 p.m.
Panel Description: The Buzz in Olde New York – January 25- 3:00 p.m. The first take on history is defined by the press, which often focuses the lens through which future generations will interpret events and public figures. This panel discusses the impact of an early free press on shaping the myth of Lord Cornbury, the political and cultural evolution of the young city of New York, and how the rise of that early press parallels the advent of alternative media and online journalism practiced today. Kathleen Hulser: Kathleen Hulser’s background includes work as a public historian, college teacher, museum administrator, exhibitions curator, public programs director, writer, editor, and media producer. Recent museum projects include such programs & exhibits as: Grant and Lee in War and Peace- Legacies: Contemporary Artists Reflect on Slavery- The Rosenbergs Reconsidered: The Death Penalty in the Cold War Era- Up on the Roof: New York on the Rooftops and Reading Uncle Tom’s Image. Ms. Hulser recently produced New Captivity Narratives, a video installation that juxtaposes modern testimony from the enslaved with classic narratives of Frederick Douglass and Harriet Jacobs. In 2007, she produced “The French Revolution, Lafayette and the Guillotine” for the exhibition French Founding Father: Lafayette’s Return to Washington’s America. On iTunes University, you may view her latest production of an iPod tour, “Frederick Douglass and the Underground Railroad in New York.” Ms. Hulser maintains an active leadership role in the public history field by delivering many papers at professional meetings, organizing conferences, guest lecturing, and leading collection initiatives and community collaborations. Ms. Hulser can be seen making public history appearances on CBS, BBC, PBS, History Channel, NY1, Discovery Channel, Paxton Network, and NPR. Nicholas F. Benton: Nicholas F. Benton is the founder, owner and editor-in-chief of, and national affairs columnist for, the Falls Church News-Press, a Northern Virginia weekly that since 1991 has gained a widespread reputation as the most progressive newspaper in the state. Circulated inside the “Washington D.C. beltway,” it was the only newspaper in Northern Virginia to endorse Barack Obama last year, and its core distribution area provided more than the total margin of victory for Obama statewide, as Virginia went Democratic in a presidential election for the first time since 1964. A native of California and graduate of Westmont College (A.B.) in his Santa Barbara hometown, and the Pacific School of Religion (M.Div.) in Berkeley, Benton was a leading San Francisco Bay-area activist in the earliest post-Stonewall days of the gay liberation movement. As an openly gay and politically active newspaper owner, Benton was named “Businessman of the Year” for 2007 by the Falls Church City Council, which also twice been named his newspaper “Business of the Year” (1991 and 2001). He’s served two terms as president of the Falls Church Chamber of Commerce, named the recipient of its “Pillar of the Community” award twice (1992 and 2003). Last year, the City Paper in Washington, D.C., named his paper the “Best Remnant of the Liberal Media” in its annual “Best of D.C.” edition. Chris Anderson: A long-time reporter and editor with New York City Indymedia and The New York Indypendent, Chris Anderson is in his final year of a PhD in communications at Columbia University, where he is studying journalistic authority, media history, and the emergence of new media technologies. Anderson’s dissertation, &#8220Networking the News: Work, Knowledge and Occupational Authority in the New Metropolitan Journalism,&#8221 focuses on the impact new technologies are having on the media by examining newsrooms practices used by traditional news organizations, bloggers, and citizen media projects in Philadelphia, Pa. Anderson is the co-author of &#8220News Production and Organizations: Professionalism, Objectivity, and Truth Seeking,&#8221 published in the Handbook of Journalism Studies. He holds a B.A. in Political Science from Indiana University, a MA and MPhil from Columbia University. He lives in Brooklyn with his partner Jessica and two mischievous cats. About the playwright and company: William M. Hoffman (playwright) is best known for his groundbreaking play about the AIDS epidemic, As Is, for which he was nominated for the Tony and Pulitzer Prize and received the OBIE and Drama Desk awards. New York Magazine recently named it one of the most significant New York cultural works of the past 40 years. He also wrote the libretto for the Metropolitan Opera’s The Ghosts of Versailles with music by John Corigliano. Commissioned by the Metropolitan Opera in honor of its centennial. Theatre Askew’s inaugural production, Bald Diva! earned unanimous critical acclaim over its several runs, including a GLAAD Media Award nomination for Outstanding Off-Off Broadway Play and a “Best of 2004” nod from Theater Mania. Their follow-up show was the hit serial I, Claudius Live. Last year they received their second GLAAD Media Award nomination for the world-premiere production of Jason Schafer’s i google myself. For their work on that show, the company was named 2007 People of the Year by nytheatre.com. collaboration with The New York Historical Society and will feature public historian Kathleen Hulser, Nicholas F. Benton, publisher and editor of the alternative newspaper The Falls Church News-Press, and new media scholar Chris Anderson. Panel Description: The Buzz in Olde New York – January 25; 3:00 p.m.
Kathleen Hulser: Kathleen Hulser’s background includes work as a public historian, college teacher, museum administrator, exhibitions curator, public programs director, writer, editor, and media producer. Recent museum projects include such programs & exhibits as: Grant and Lee in War and Peace; Legacies: Contemporary Artists Reflect on Slavery; The Rosenbergs Reconsidered: The Death Penalty in the Cold War Era; Up on the Roof: New York on the Rooftops and Reading Uncle Tom’s Image. Ms. Hulser recently produced New Captivity Narratives, a video installation that juxtaposes modern testimony from the enslaved with classic narratives of Frederick Douglass and Harriet Jacobs. In 2007, she produced “The French Revolution, Lafayette and the Guillotine” for the exhibition French Founding Father: Lafayette’s Return to Washington’s America. On iTunes University, you may view her latest production of an iPod tour, “Frederick Douglass and the Underground Railroad in New York.” Ms. Hulser maintains an active leadership role in the public history field by delivering many papers at professional meetings, organizing conferences, guest lecturing, and leading collection initiatives and community collaborations. Ms. Hulser can be seen making public history appearances on CBS, BBC, PBS, History Channel, NY1, Discovery Channel, Paxton Network, and NPR. Chris Anderson: A long-time reporter and editor with New York City Indymedia and The New York Indypendent, Chris Anderson is in his final year of a PhD in communications at Columbia University, where he is studying journalistic authority, media history, and the emergence of new media technologies. Anderson’s dissertation, “Networking the News: Work, Knowledge and Occupational Authority in the New Metropolitan Journalism,” focuses on the impact new technologies are having on the media by examining newsrooms practices used by traditional news organizations, bloggers, and citizen media projects in Philadelphia, Pa. Anderson is the co-author of “News Production and Organizations: Professionalism, Objectivity, and Truth Seeking,” published in the Handbook of Journalism Studies. He holds a B.A. in Political Science from Indiana University, a MA and MPhil from Columbia University. He lives in Brooklyn with his partner Jessica and two mischievous cats. Theatre Askew’s inaugural production, Bald Diva! earned unanimous critical acclaim over its several runs, including a GLAAD Media Award nomination for Outstanding Off-Off Broadway Play and a “Best of 2004” nod from Theater Mania. Their follow-up show was the hit serial I, Claudius Live. Last year they received their second GLAAD Media Award nomination for the world-premiere production of Jason Schafer’s i google myself. For their work on that show, the company was named 2007 People of the Year by nytheatre.com[/CATS].